New Delhi, Nov 30, 2015 (PTI): Petrol will cost Rs 60.48 per litre from mid-night tonight in Delhi as against Rs 60.70 a litre currently. . The price of petrol was today cut by 58 paise per litre and that of diesel by 25 paise, reversing the trend of increasing rates, on global cues. Petrol will cost Rs 60.48 per litre from mid-night tonight in Delhi as against Rs 60.70 a litre currently. A litre of diesel will cost Rs 46.55 from tomorrow compared with the Rs 46.80 now, said Indian Oil Corporation (IOC), the nation’s biggest fuel retailer. The price cut more than reverses the hike of 36 paise a litre in petrol rates effected on November 16, the first increase in five months. Similarly, in the case of diesel, it reverses the three rounds of hikes since October -- the last being 87 paise a litre on November 16. "The current level of international product prices of petrol and diesel and rupee-dollar exchange rate warrants a decrease in prices, the impact of which is being passed on to consumers with this price revision," IOC said in a statement here. Prior to the November 16 hike, petrol price had been slashed on four occasions -- by Rs 2.43 on August 1, Rs 1.27 on August 16, Rs 2 on September 1 and 50 paise on November 1. Diesel rates were not changed on November 1, but hiked by 95 paise on October 16 and 50 paise on October 1. 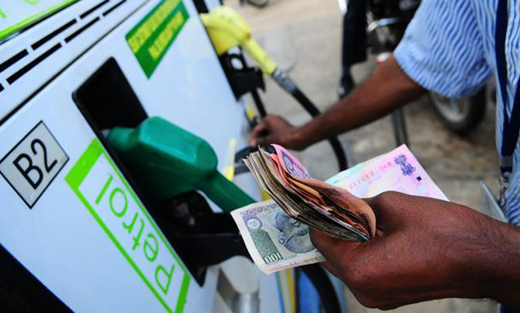 Rates of diesel were last cut by 50 paise on September 1.